In the village of Roslin, just a couple of miles south of Edinburgh's bypass, lies one of the most remarkable pieces of church architecture in Scotland. Since its construction began in 1446 Rosslyn Chapel has evoked wonder and surprise with the beauty and intricacy of its stonework. And it has consistently defied categorisation by those architectural historians who like nothing better than to attach labels to buildings. Possibly the most surprising thing about Rosslyn is that it is only a small part of what its founder had in mind. Sir William St Clair's original intention in founding the Collegiate Church of St Matthew was to build a large cruciform church with a tower at its centre. Quality took precedence over speed and by the time of Sir William's death in 1484 only the walls of the choir of his church and parts of the east walls of the transepts had been built, together with the foundations of part of the nave. Sir William was buried in the incomplete choir which was subsequently roofed by his son and turned into a chapel, but work ceased on the rest of the church. 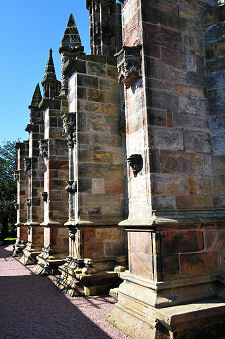 The chapel served as a family house of worship through most of the 1500s, though the St Clair's continued Catholicism after the Reformation in 1560 led to considerable tensions with the Kirk. The altars were finally destroyed in August 1592 and the chapel fell into disuse. During their attack on nearby Rosslyn Castle in 1650, Cromwell's troops used the chapel as stables, but left it otherwise unharmed. In December 1688 locals attacked the "popish" chapel during the "Glorious Revolution" that led to the accession to the crowns of England and Scotland of William and Mary (see our Historical Timeline). Restoration of the chapel was begun in 1736 by James St Clair, who reglazed the windows and made the building weatherproof once more. More repairs followed through the 1800s, and in 1861 the 3rd Earl of Rosslyn restarted Sunday services at the chapel. The baptistry and organ loft were added to the west end in 1881. The chapel continues to this day to be a working church, and is part of the Scottish Episcopal Church, a member of the world-wide Anglican Communion which traces its history back to St Columba and the early days of Christianity in Scotland. The 1900s were a story of ongoing restoration of the chapel, some with unwanted side-effects. 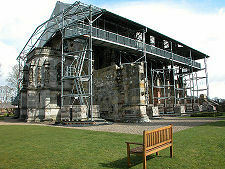 Work in the 1950s to weatherproof the roof led to dampness throughout the structure and in 1997 a free-standing steel roof was erected over the chapel to protect it and allow it to dry out. The free standing roof was finally removed in 2010, after the 1950s work had been undone and the roof made weathertight. The freestanding roof had the disadvantage of dominating external views of the chapel, and it also deprived the interior of much of the natural light that would otherwise have flooded in through the windows. On the other hand, a walkway below the roof did allow close-up views of the upper parts of the outside of the chapel that literally added another dimension to the appreciation of the building. Today's visitor starts their visit to Rosslyn Chapel in a second beautiful piece of architecture, the visitor centre that opened to the public in 2011. This is a suitably remarkable building that seems to hover above its site, and which looks wonderfully insubstantial when viewed from some angles. Quite a trick, given that it is actually quite a large building offering reception facilities and background information about the chapel; plus a shop selling tastefully appropriate merchandise, and a cafe with a superb view over the glen behind. After emerging from the visitor centre you approach the chapel from the north. When you enter Rosslyn Chapel for the first time you finally begin to understand why it has exerted such a powerful influence for over five centuries over many generations of visitors including Mary Queen of Scots, Queen Victoria and Queen Elizabeth II. 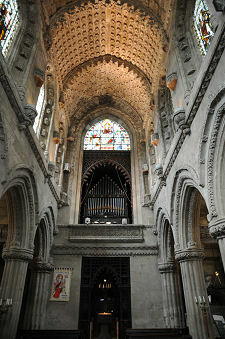 The beauty and detail and sheer extravagance of its carved stonework has to be seen to be believed. You get the real sense that the people who worked here really enjoyed showing off their skills for the benefit of future generations. There is virtually no surface in any part of the chapel that has not been painstakingly worked on, with magnificent results. One element stands out as worthy of particular mention. 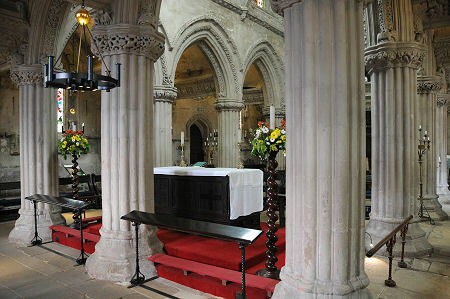 At the meeting of the South Aisle and the Lady Chapel is the stunningly carved pillar known as the apprentice pillar. It is said that the master mason was instructed by Sir William St Clair to build a pillar to match a drawing he had provided. The master mason went to Italy to study the original, and in his absence an apprentice produced the magnificent pillar on view today. The story does not have a happy ending: the master mason was so consumed with envy on his return that he killed the apprentice with a blow from his mallet. 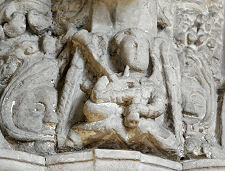 The mason and the apprentice are believed to have inspired two of the gargoyles placed high up in the west end of the choir, supporting structures that once housed statues. The "apprentice" has a dent in his head, and the mason is placed so that, as a punishment for his crime, he must forever gaze diagonally across the chapel to the apprentice pillar that so offended his professional pride. If Rosslyn Chapel's sheer beauty has served to attract visitors from around the world, so has the aura of mystery and legend that surrounds it. 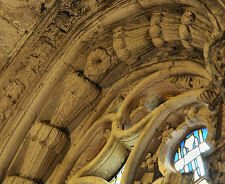 One popular story is that Sir William St Clair's grandfather, Henry Sinclair, was part of an expedition which reached Nova Scotia in 1398, and this is supported by carvings in the chapel which certainly look as if they depict Indian corn, supposedly unknown in Europe at the time of the building of the chapel. 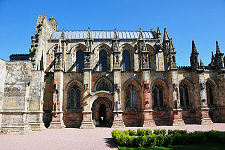 There are other legends which link Rosslyn Chapel with the Knights Templar and the Masons. Sealed burial vaults below the chapel are said to contain the remains of ten Barons of Rosslyn in their full armour. And some people believe that these vaults, or other parts of the chapel, may also contain the Holy Grail, or the Ark of the Covenant, or part of the actual cross on which Christ was crucified. Meanwhile the chapel's alleged Masonic links are held by some to explain why Cromwell's troops spared the chapel in 1650. Some of these theories are intriguing and some are attractive, while others veer towards the fanciful. But they certainly add to the atmosphere of this wonderful place. 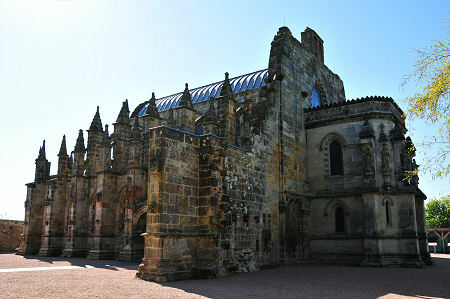 The legends surrounding Rosslyn Chapel found a point of focus when the chapel served as the setting for the climactic closing scenes of Dan Brown's hugely popular novel "The Da Vinci Code" published in 2003, and the Ron Howard film of the same name released in 2006. Dan Brown has succeeded in bringing Rosslyn Chapel to an even wider audience and visitor numbers have increased dramatically as a result. It is a wonderful place at any time, but as it is open all year round, we'd recommend you pick the most off-season moment possible, as you only really begin to appreciate the magic of the chapel to the full if you are fortunate enough to find yourself visiting on a quiet day. STB 4 Star Visitor Attraction. Chapel Loan, Roslin, EH25 9PU.